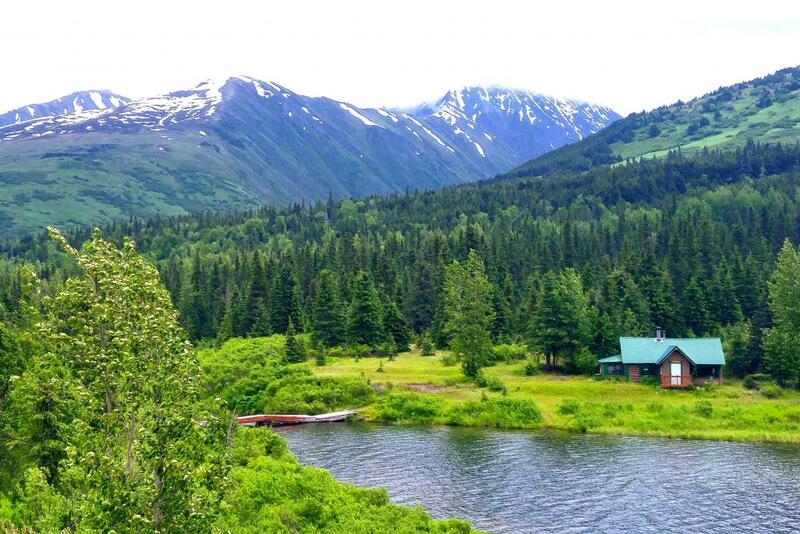 Once we finally arrived on the west coast after our delayed departure from Florida due to my shoulder surgery we worried about shortening our drive time to Alaska. I was looking at vacationstogo.com and found a two week cruise that went all the way to Anchorage before heading back to Seattle. That sounded perfect, we would be gone two weeks instead of the shortened four weeks but no driving, fuel consumption, camping fees, etc. Plus all meals included! The one and only down side was what to do with DeeO'gee. We looked and found a sitter, then thought we had another option but ended up using Rover.com. A stay at home mom with a brand new baby, they also had a small dog and a fenced back yard. Reports I received stated the two played so hard they collapsed on the floor around dinner time and didn't come back to life until morning. We missed him but knew he was having as much fun as us. The Amsterdam is a mid size ship with only 1300 passengers. We settled into our room with its king size bed, sofa and coffee table. TV with DVD player and a list of movies to order, fresh fruit delivered and room service 24 hours a day included. Our first day was at sea which we really enjoyed. Kicked back and relaxed we explored the ship, watched whales periodically surface, played cards and music trivia. Dining options ranged from pool side burgers to cafeteria style buffet and the formal dining room. Three Gala Evenings allowed us to break out seldom used dress clothes. A gourmet restaurant was available for an added fee but we were quite happy with our included choices; lobster, crab, shrimp and several steak choices. 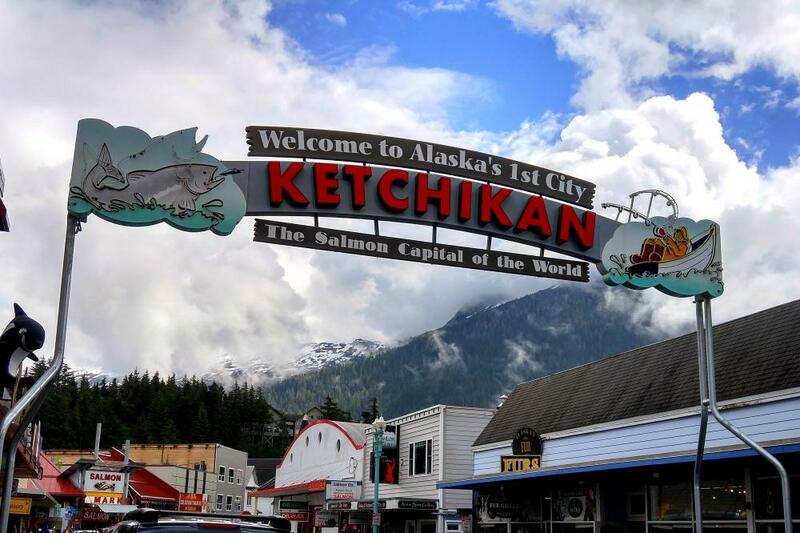 Ketchikan was Alaska's first town, small yet the 5th largest town in the state. We took a self guided walking tour and visited the old red light district, the requisite fish hatchery and a totem pole museum. It was nice to be at the pier and to be able get on and off the ship at will, no cumbersome tenders involved. We didn't understand all the people eating at restaurants on shore when the food on our ship was very good and included in the price, but beer was another story. Microbrew pubs were abundant and begged for visits. 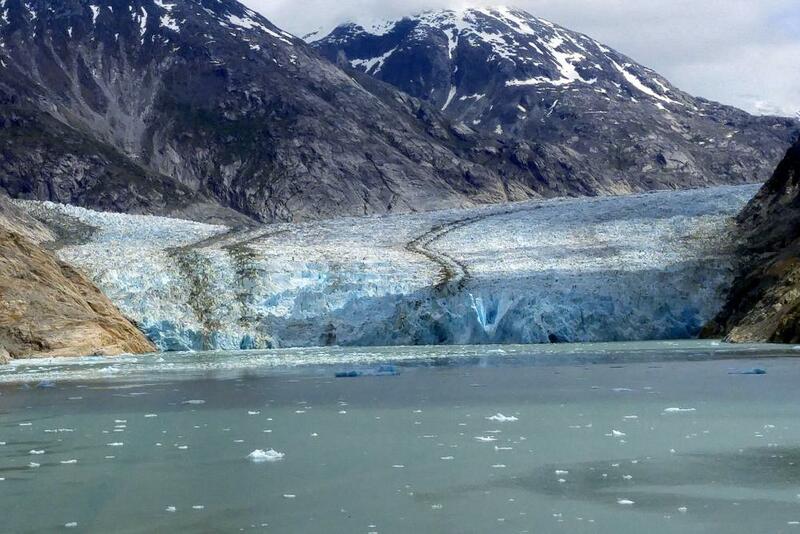 A day of scenic crusing was taking us to Tracy Arm but there was too much ice flow blocking the entrance to the glacier from calving, big chunks breaking off, so we visited Dewey glacier instead. A glacier is a body of growing ice that moves under its own weight. There were many whales at the entrance to the arm and I finally saw my first whale tale. In the Caribbean we had seen many whales but the elusive tail escape my view. In fact I saw several whales breaching and seal pups laying in the sun on floating ice chunks with their moms, even Dewey Porpoises were often putting on a show. 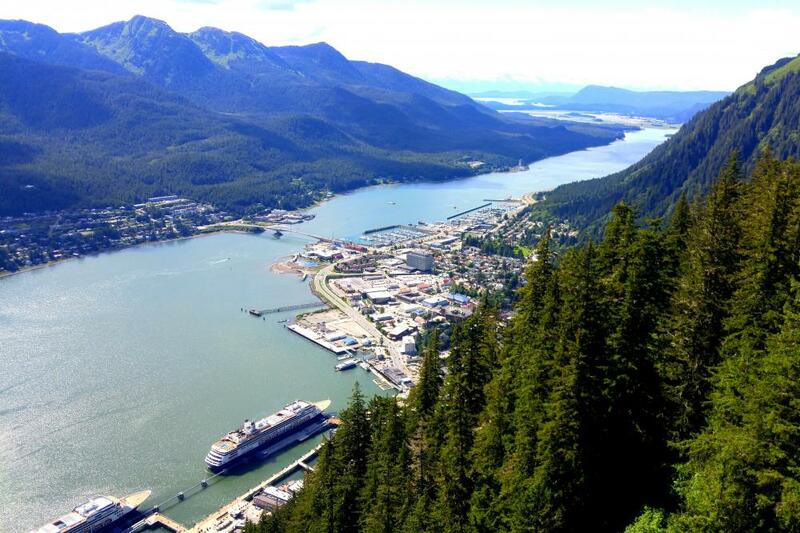 Next we visited Juneau, America's only capital city not accessable by land. Here is where the gold rush got it's start and the capital was moved here from Sitka shortly after. There were several major gold mines in operation during the peak of the gold rush but all were closed for various reasons. The last being because of lack of man power during world war two. That mine was so prolific that it is considered being reopened if they can clear all the permits needed. The major problem being what to do with the all the rock and dirt that comes from the mine during processing for gold. In the early days it was just dumped into the bay and created the extension of land the city rests on. Mendenhal Glacier and the sky tram were the only shore excursions we had booked so we could enjoy another slow and easy day. There are glaciers everywhere, some times several are in view at once. Some are advancing and others are receding, Mendenhal is a receding glacier. That means the glacier is melting and calving a greater rate than it is moving forward. A beautiful waterfall ran just off to the side and the setting in this bay was breathtaking. While cold at night and early mornings, days that the sun appeared were quite comfortable but the days the sun didn't appear with dreary mist were darn cold and we were glad we had packed coats for the trip. Anchorage is really just another big city, it's what surround this city that makes it special. We rented a car to drive to Seward and the Kenai Peninsula and saw many many motorhome along the way. Another couple joined us for our outing and we all enjoyed a beautiful day of sight seeing. 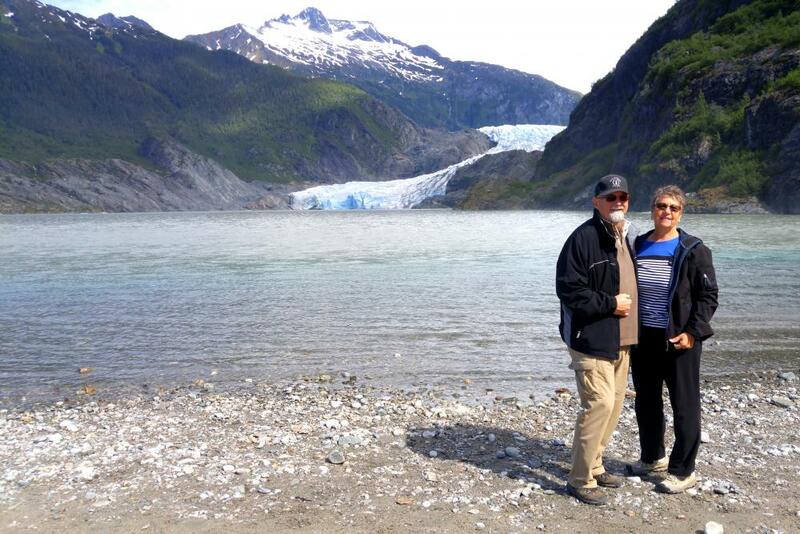 Kenai Fjords National Park was one of the parks that we were near enough to view it's magnificent scenery. 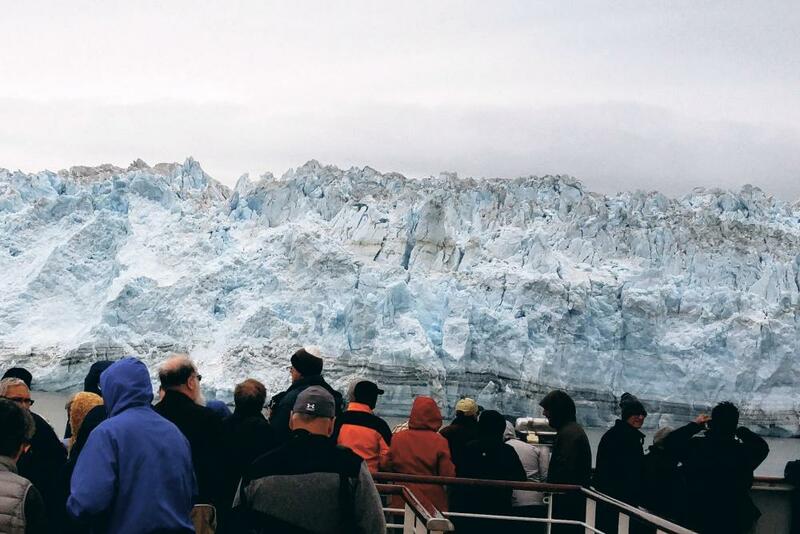 The other two were viewed from the ship as the majestic mountains of Glacier Bay and Wrangell-St. Ellis rose above the seashore adding a bonus to our time moving between ports. Two small harbors were next. Homer and Kodiak were short stops and cute little ports to wander. All these stops had numerous shore excursions available from fishing to do flight seeing for those with very deep pockets. We enjoyed not having a schedule especially since the weather was often less than ideal. Hubbard glacier is massive and advances 7 feet a day, after loss from melting and calving the net growth is about 80 feet a year. It is over 600 feet deep, 7 miles wide and 76 miles long. It starts at Mt Logan the second tallest mountain in North America and part of Wrangell-St Ellis National Park. Ice at the terminus is 450 years old. Our captain brought the ship to within 1/4 mile for an up close and personal experience. We had snagged easy chairs in the Crowd Nest Lounge and spent the day thoroughly enjoying the views a and camaraderie of fellow passengers. Sitka, Sitka, Sitka. It's a charming small town only accessable by boat or plane. They get 10-12 feet rain a year and there was a light drizzle the entire time we were there. 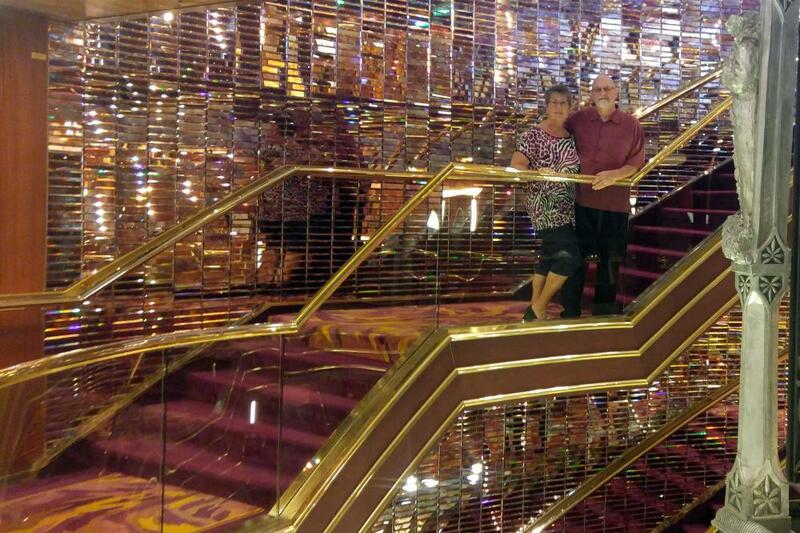 The ship provided umbrellas and we wandered around town looking for Betty White. We watched The Proposal again on the ship that night and have determined it wasn't filmed there. It is not an inexpensive place to live with a Big Mac or a dozen eggs costing $8.00. Not sure why anyone would choose to live there. 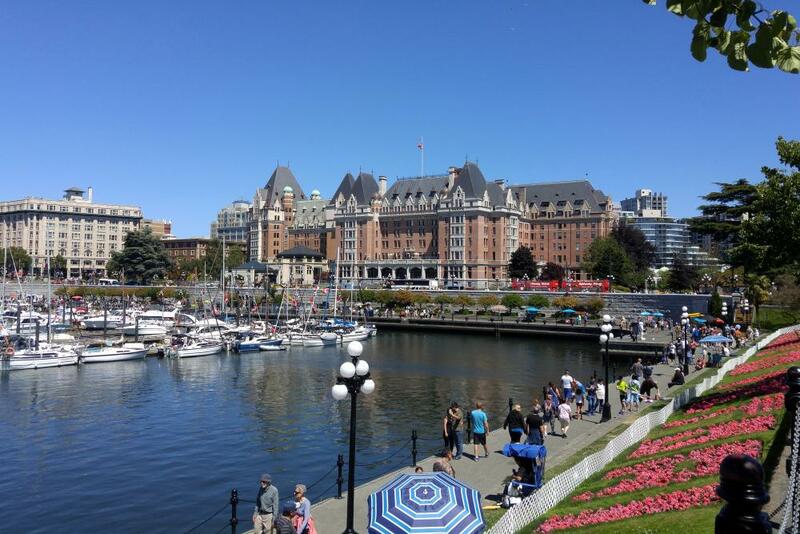 There last stop was Victoria on Vancouver Island. It was a weekend of festivities celebrating Canada's 150th anniversary. Lovely flowers decorated this charming harbor city. Our day included outdoor music on various streets and local brew pubs. We walked the town until we could walk no more. A wonderful cruise that we would recommend to everyone!